Australian women’s cricket has taken a “monumental” step forward in what Ellyse Perry described as a highlight of her career. How big? According to women’s legend Belinda Clark, the game has jumped forward two or three years this season alone. 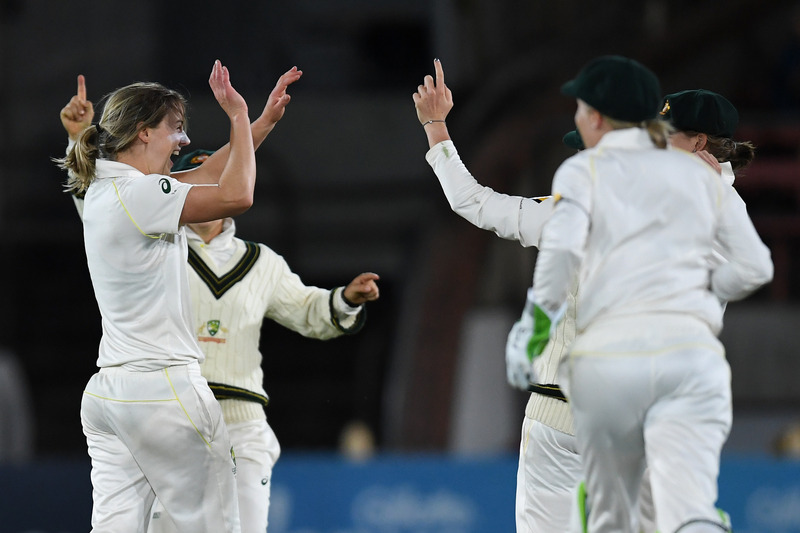 Almost 3000 people were at North Sydney Oval for the inaugural day-night women’s Test as the pink ball shone under lights with England heading to stumps at 7-235 after day one. Bigger crowds are expected over the next three evenings, with weekends a more enticing option for young fans. “To come out on a North Sydney Oval that looked like it did today and to see the people that rolled in and the atmosphere it created – I think it’s a monumental step forward for women’s cricket,” Perry said. “And I think a huge amount of kudos goes to Cricket Australia for creating what they have today. The women’s game has grown so much in Perry’s career alone since she made her one-day debut in 2007. Games that wouldn’t even have come close to being televised are now regulars on free-to-air TV, while the professional era and a focus on Twenty20 cricket has driven a harder-hitting product. The Ashes series comes off the back of 24,000 people packing out Lord’s this year for the women’s 50-over World Cup final, while the Women’s Big Bash League has driven increased popularity in Australia. “We’ve probably been working or building towards this for four or five years,” said Clark, who was recognised as the first female Don Bradman Gala Dinner Honouree on Wednesday night. “I think the surprise element is how much ground we’ve made in such a short time. Australia’s leading Test and one-day run scorer, Clark last played for her country in 2005. She now works as Cricket Australia’s head of junior cricket, overlooking a vast majority of the 393,000 female participants now involved in the game. But even she could not have predicted the game’s meteoric rise since her retirement. “Who would have though 15 or 20 years ago that you would be playing an Ashes Test under lights as part of a multi-format series,” she said.